Ooh, how awkward — but is this a case of tech being accidentally inconsiderate? Or does it imply something more… inneresting?? Justin Bieber may have accidentally given the world a little Instagram insight into the status of his relationship with ex Selena Gomez. 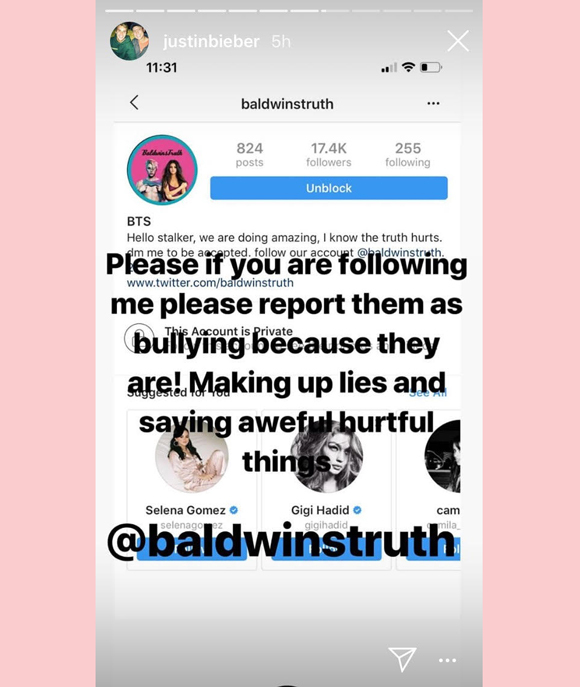 On Thursday, Justin posted to his IG Story to try to get an account banned for telling made up stories about him. Yep. The number one suggestion IG is giving Justin about who to follow is his ex-girlfriend. So there are a number of reasons this could be happening. Facebook, which owns Instagram, is pretty tight-lipped with their algorithms, as are pretty much all tech companies these days. So we don’t know for sure why it would be suggesting Selena. But here are all the usual reasons — most of which are pretty benign. 3 3. Their Previous Interactions. They were a couple, off and on, for years. They ran in the same circles. They probably still talk to some of the same people. But, um, do they though? Neither follows a ton of accounts. They both follow Cardi B, but hey who doesn’t?? OK, does IG really still lump people together the old-fashioned way, by sort of setting up strangers? Like a friendship dating site? We remember when social networks did this back in the day, and it didn’t seem like it was very successful. Not to mention they don’t post about the same things or mark themselves in the same places anyway. IG obviously has a log of the many people you interact with, everyone you DM and tag and whose posts you comment on. When two people are dating and active on IG, their digital fingerprints are going to be ALL OVER one another. So… does Instagram rank that mathematically and recognize they must be friends? To buy that you’d have to assume the algorithm doesn’t also keep track of when you STOP talking to someone. That would mean this happens ALL THE TIME. Every time any couple breaks up, any friendship ends, IG tries to awkwardly shove them back together. That sounds like a design flaw to us. No offense, Lindsay. Or Lindsay. OK, just coming out and saying it. One of the main reasons IG would suggest you follow someone is because you are basically ALREADY following them. If you’re clicking on their feed all the time, looking at their pics, reading their comments — Instagram is going to assume you want to follow them. It’s basically the same thing, only with notifications. We mean, right?? Haven’t we ALL experienced this shady phenomenon??? You’re sneakily checking someone’s account out, but you don’t want to *really* follow them. Next thing you know, they’re ALL over your suggestions. Ugh. So is married man Justin still cyberstalking his ex? Did he just give himself away?? What do YOU think, Perezcious ‘grammers?? Is it just a pitfall of modern technology? Or telling us something about the Biebs’ bad habits? ?